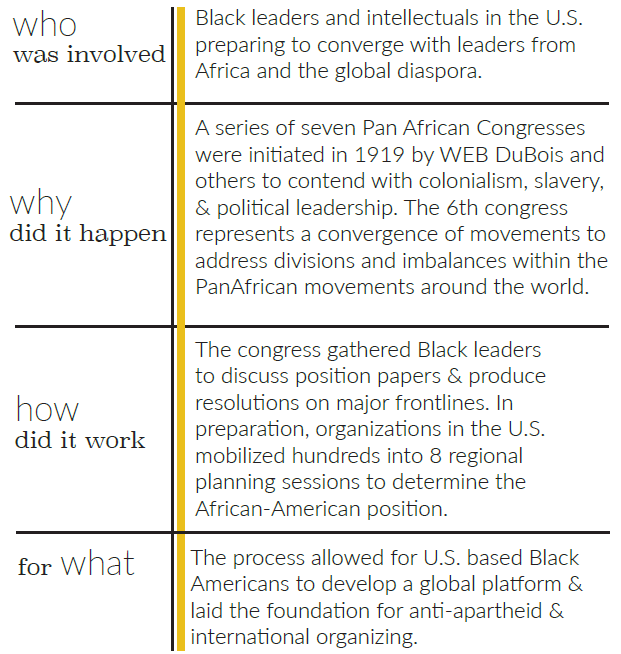 These snapshots demonstrate examples of historic & current people’s movements that use assemblies and popular gatherings to make action plans, decisions, and political commitments. The following descriptions represent case studies, not complete histories. These snapshots are designed to inspire and encourage further investigation. All references and citations are available in the downloadable handbook. 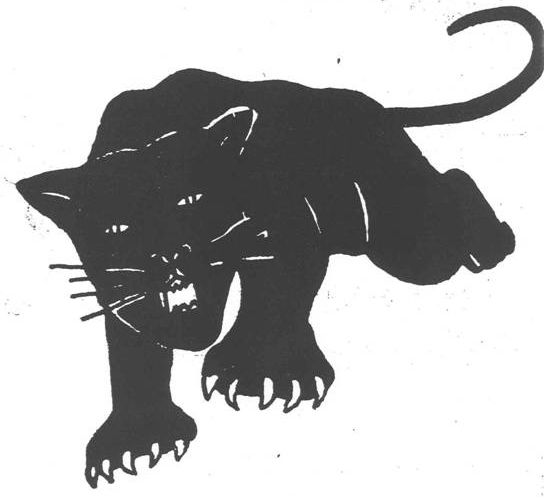 Organized by residents and members of SNCC (Student Nonviolence Coordinating Committee), Lowndes County Freedom Organization was an independent political and movement organization in the Black Belt of Alabama. The symbol of the whites-only Democratic party was a rooster, so illiterate white voters were instructed to “Vote for the rooster.” When the Lowndes County Freedom Organization got their independent political party on the ballot, they had to chose a symbol. They chose a black panther. In June 1974, the Sixth Pan African Congress (6PAC) was held in Tanzania, independent Africa’s most progressive nation. Across much of the late 1960s and early 1970s, the U.S. Black Power Movement continued to put on display its pan-Africanist impulse. 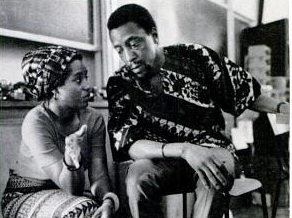 Though various efforts were made to boost Black popular and political support for African liberation, activists identified the lack of functional unity between Africa and its diaspora as a problem of increasing importance. In a context in which regions in Africa were still under colonial rule, not to mention independent nation states having little to show for their enormous efforts at nation building, Black Power activists feared that the commonalities between these various Black and African struggles were being greatly overlooked. 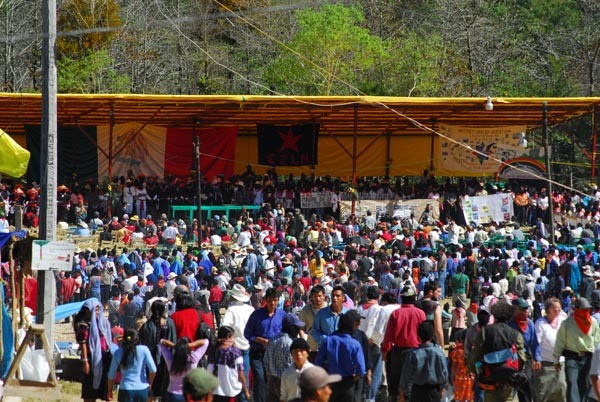 Over two decades after it first drew the attention of the world by attempting to overthrow the Mexican government, the Zapatista Movement for National Liberation (EZLN) continues to quietly resist capitalism and neoliberalism. On January 1, 1994 the Zapatistas became known internationally when they seized several cities in the Mexican state of Chiapas. Indigenous communities in Mexico had suffered for decades as a result of eliminating constitutional rights to land and other forms of neoliberalism. They purposely initiated their uprising on the same day that NAFTA, the North American Free Trade Agreement, went into effect. Their goal was to overthrow the government and create areas where Mexicans could govern themselves autonomously. The offensive lasted 12 days, and a peace agreement with the Mexican government, the San Andreas Accords, was eventually reached in 1996. Communication with the government ceased after it reneged on the promises it had made. Today, the Zapatistas control territory in the northeastern part of Chiapas, which is divided into five regions called Caracoles. They resist by serving as an example for others to follow: they aspire to build a new system from the bottom up that revolves around the people. 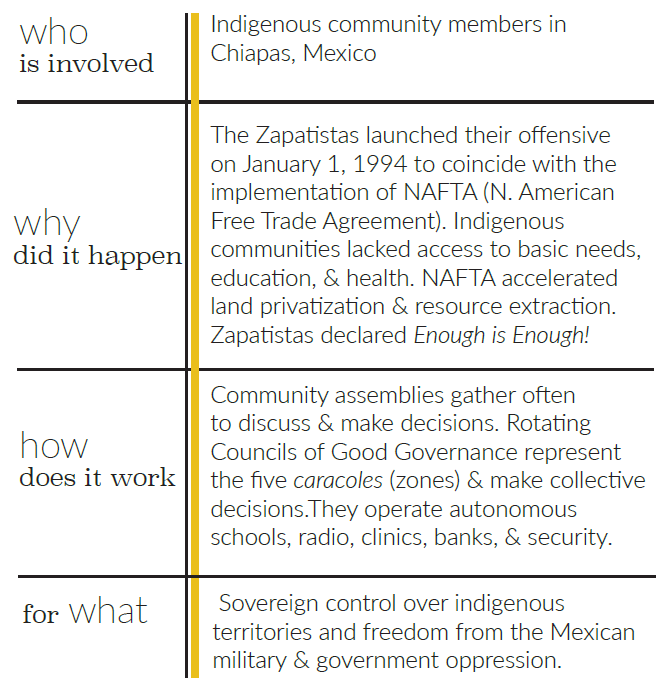 The Zapatistas receive no money or aid from the Mexican government, all resources are supplied by the community or outside benefactors. They have no prisons, and their education and healthcare systems are community run and maintained. Communal business collectives and cooperatives make goods to export and for local consumption. Because, friends and enemies, when rebellion is individual it is pretty. But when it is collective and organized it is terrible and marvelous. The former is the material of biographies; the latter is what makes history. Egyptian dictator Hosni Mubarak rose to power in 1981, and went on to rule Egypt under a state of emergency for thirty years. The brutality of his police forces was widely known and acknowledged among members of the public. 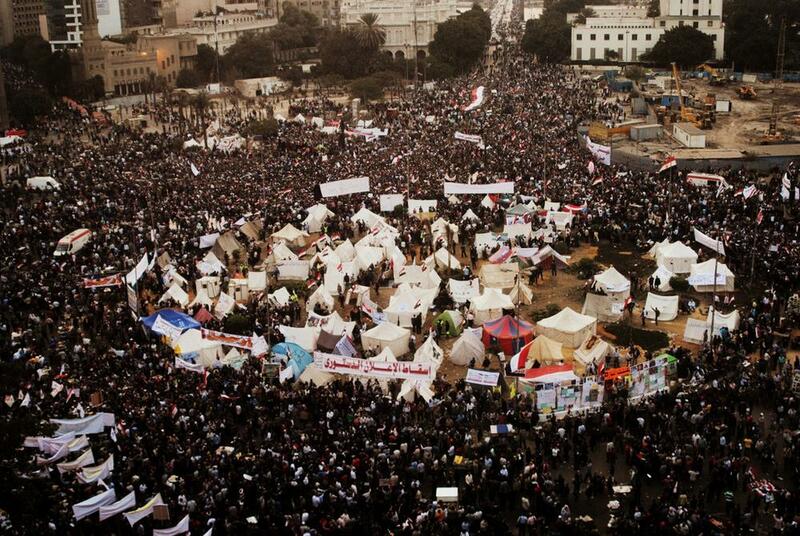 Inspired by the successful revolution in Tunisia, tens of thousands of Egyptians took to the streets on January 25, 2011 to call for an end to Mubarak’s police state. Eighteen days later, on February 11, Mubarak stepped down. Many have characterized the Egyptian uprising as “leaderless,” and while it is true that there wasn’t one individual or organization that claimed to represent the masses of protestors, the revolution was guided by a few key entities. The April 6 Youth Movement, which spearheaded the majority of the initial organizing, was arguably the most influential. April 6 came out of a massive textile strike that occurred in April of 2008, and its members had been working to get another mass movement started ever since. 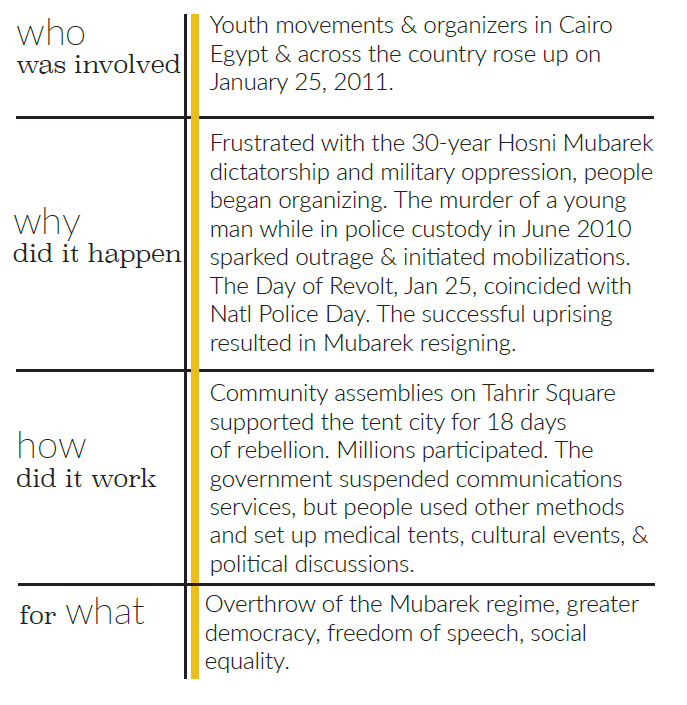 In the years and months leading up to the uprising in 2011, April 6 members were trained in nonviolent direct action methods, and looked to other nonviolent movements that overthrew dictators for inspiration. 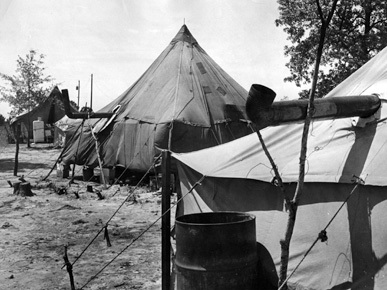 So they continue, building the city in the field to complete its facilities; building the makeshift hospital, wherein lies the injured tended by volunteer doctors and nurses from the crowds of young people; building the city in the field for which people volunteered blankets and medicines, cotton and linen, food and water. This is like a dream. I live with these young men and women day & night, watching as they form committees to take on the work of daily cleaning the field to the transfer of the injured to hospital, to the provision of food and medicines, to defending the field and responding to the regime’s lies in the media, to the nomination of names for the transitional government. The Kurds call it a radical democracy project. 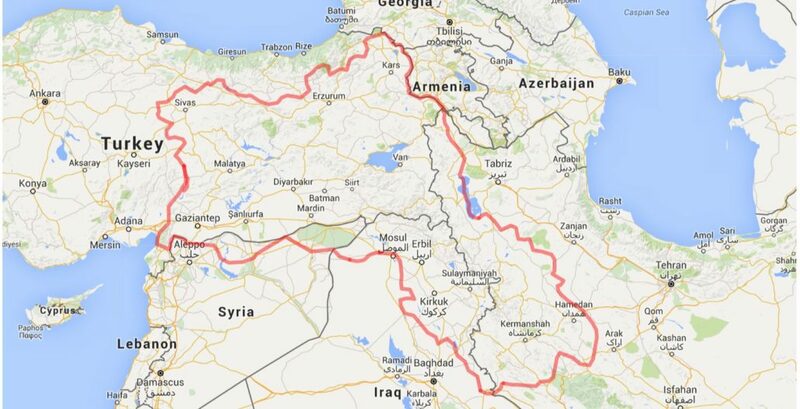 Kurdistan is divided into four regions; occupied by Turkey in the North or Bakur, Iraq in the South or Bashur, Iran in the East or Rojhelat, and Syria in the West or Rojava. Without the protection of a nation-state while also under attack from militarized fundamentalists of all stripes, the Kurds have grown a significant base of power. People who have been displaced by war and disaster practice multiple forms of direct democracy, society-building, and alternative institutions. 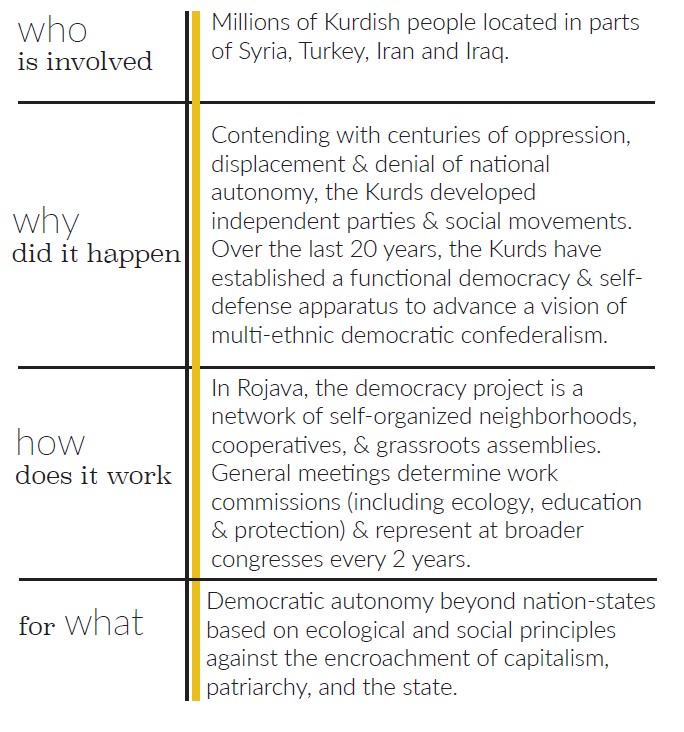 Over the last 15 years the Kurdish Workers Party, a part of the larger and historic Kurdish Liberation Movement, has gone through ideological and practical shifts from a movement of oppressed people demanding an independent nation-state to growing a stateless democracy through radical grassroots democratic assemblies, people’s defense units, and political education. Their innovations and accomplishments contribute to U.S.-based and global liberation struggles, particularly considering communities of people within nation-states who are considered second class or non-citizens. For the moment, at least, it is possible to speak of a transitional dual system in which the democratic self-administration of Rojava lays out revolutionary and ecological principles, carefully maneuvering them in war and real politics, while the grassroots movement organizes the population from below. The Southern Movement Assembly evolved from a partnership of eight organizations in the U.S. South to a broad collaboration of 14 anchor groups and hundreds of participating organizations. 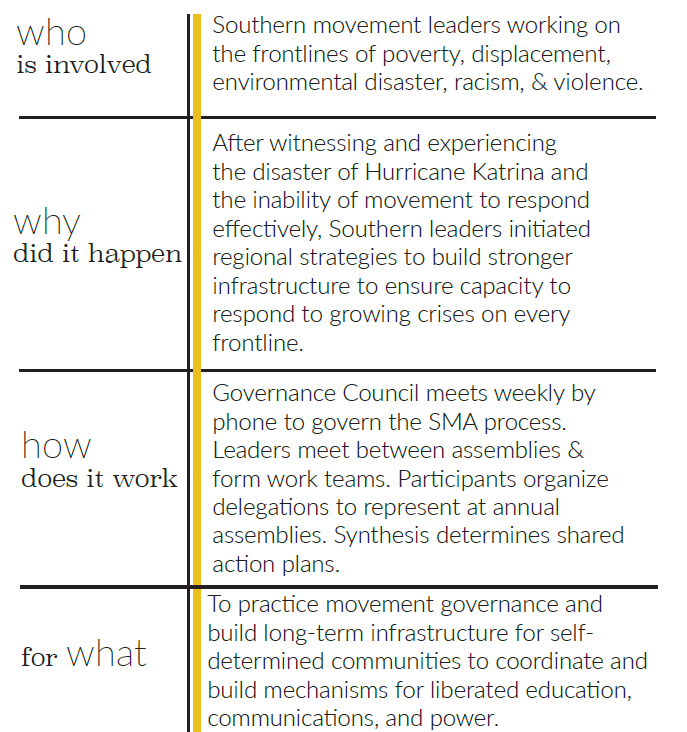 The SMA represents a growing force of coordinated, decentralized movement building in communities affected by policing, economic crisis, ecological disaster, and displacement. 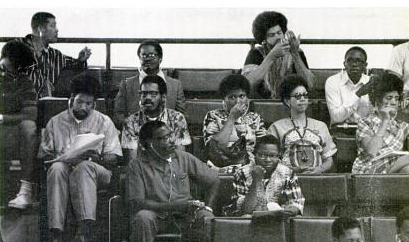 The first Southern Movement Assembly held in Lowndes County, Alabama centered the remembering of historic resistance and frontline battle for political participation. 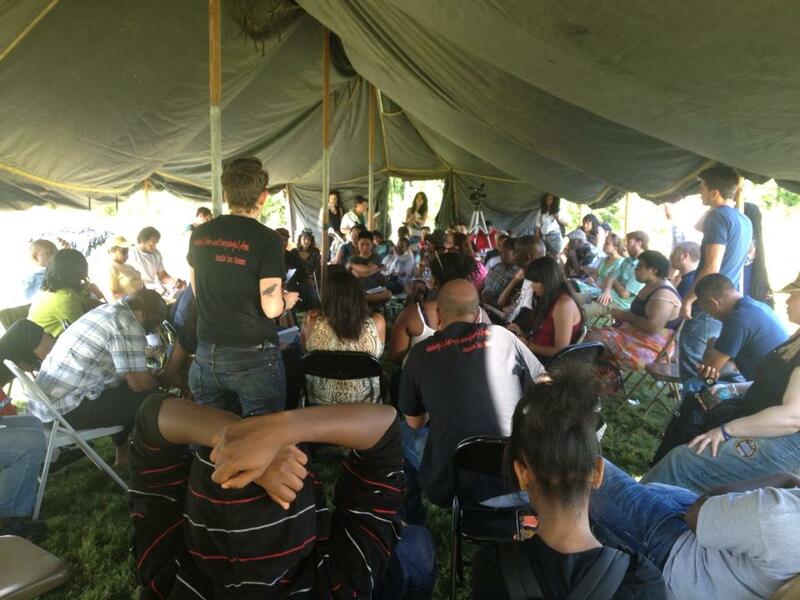 250 folks from 13 states camped for a night on the grounds of Tent City and listened to elders speak about organizing with sharecroppers for voting rights and developing autonomous political organizations. 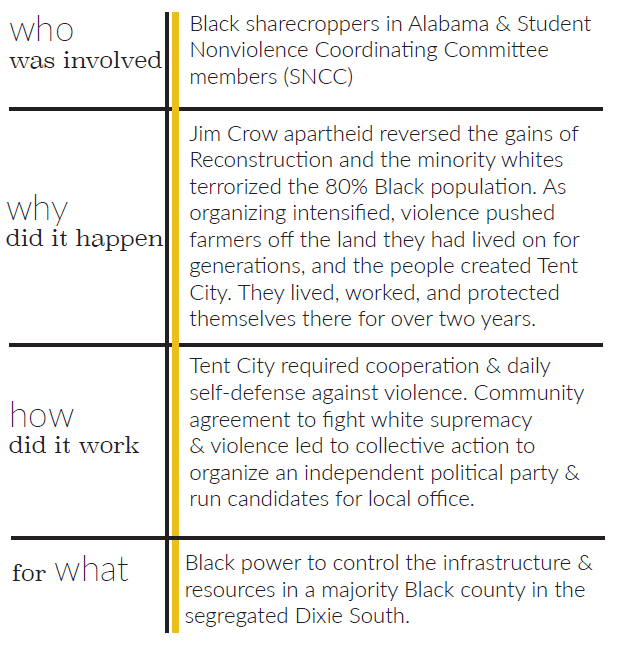 The power of the convergence and process regenerated the Southern Freedom Movement in the 21st century. Five regional assemblies have been organized over the last four years with many frontline and community assemblies happening during shared campaigns and organizing drives across 25 sites in one of the largest geographic regions in the U.S. Participants in the assemblies include Up South partners, sites where Black migration continues to shape culture and political repression like Detroit, and Global South partners where communities contend with similar patterns of neoliberal destruction. The assembly allows a deeper learning between and among communities and has sharpened the organizing of formerly incarcerated people and their families, LGBTQ and queer communities, Black youth, Gulf South communities, immigrant farmworkers, and rural Appalachians. The only thing we have to contribute to intervene on 500 years of colonialism, I believe, is Movement. It’s all we have. Other forces have the military, governments, banks, lots of money. We don’t have that, but I don’t want those things.